The Nifty has been ranging for over two-years, the ranging pattern is roughly 40% (or 1,800 pts) wide. When the market finally breaks out of these ranges the minimum expectation will be for a 40-50% advance.The most dynamic price moves occur when markets emerge from a prolonged period of sideways trading. The longer the time spent ranging the greater potential of the ensuing breakout. However, with the Nifty in US dollar and relative terms nowhere near breakout levels we are not expecting the Nifty to record a sustained breakout at this time. It’s worth noting that post the 1991-1994 ~358% advance the Nifty spent almost a decade range trading between 900-920 and 1,990-2,000 before conclusively breaking out in 2004. The problem is knowing when a genuine breakout will occur – jumping the gun could easily cost you 20-50% as the market slides back into its established trading range following a false move. 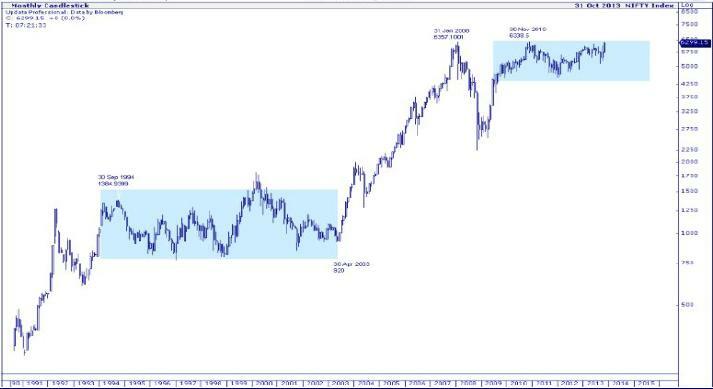 Note in 2000, the Nifty attempted to breakout of the 900-920 and 1,990-2,000 trading range only to suffer a sharp reversal and move back into the old range – a 50% decline.